Sometimes real life is stranger than fiction. That certainly is the case when considering the things that happen to Khaya Dlanga in the course of his everyday life. 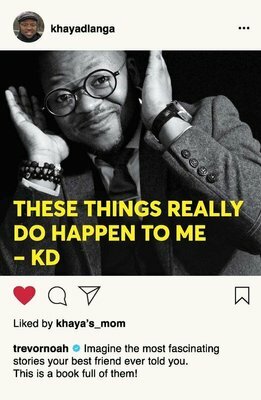 Khaya often shares these stories in brief via Instagram or his other social media platforms. He is finally succumbing to the pressure from the many people who read his posts and want more details, and is telling all of these stories and more in These Things Really Do Happen To Me. Always entertaining, and often containing astute observations regarding various social practices and situations, Khaya tells wide-ranging stories – his lunch with William Shatner; how he fell asleep next to President Thabo Mbeki; how he got hit on by a deaf girl; how his dreadlocks didn’t get the expected reaction from his mom; the greatest pick-up line ever used on him; awkward encounters with exes; what happens when you parallel park in Parkhurst; and what he has learnt in the course of his eventful life – that are guaranteed to entertain and enlighten readers.